Ever since Smugmug bought them last year I have been receiving a string of emails advising me that I need to upgrade to Flickr Pro or else I will risk losing a large chunk of my photos stored there because from next month free accounts will be limited to only 1000 photos. I was wondering how large a chunk they are talking about in my case so I logged into my account for the first time in ages and I saw that I have some 1350 photos stored there. Most of these are in albums which correspond to my blog on my photography site. In years gone by when I would do an assignment that I found interesting I would write about it and also include this album of photos via a WordPress Plugin called Flickr Justified Gallery. It works very well and saves me a lot on my bandwidth and storage of images for my photography website. As anybody who knows anything about SEO will tell you, without a blog on your site in which you create content related to the kind of work you do, don't expect to get much business from merely having a website. I can definitely attest to this as in over 10 years of being a full time pro I have never advertised my services anywhere and I am always getting work from my website. I come up on page one for all three of the specialist areas I work in in my geographic area. So it's important for me to keep those old albums up there and while Flickr has been 100% free during the time that Yahoo! ran it, I do see the value that Smugmug are presently offering with their Pro accounts. 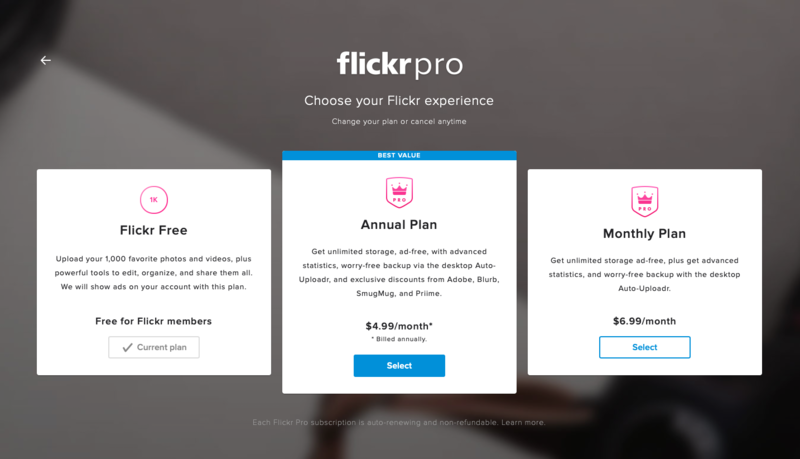 It costs $6.99 per month to host an unlimited number of images on your Flickr Pro account and according to the literature there's no restriction on the size of any individual image. If you go shopping around anywhere for hosting or cloud storage for backing up your images you are going to be paying a minimum of $10 a month for at least 1TB of disk space. I haven't found anything cheaper than this, which, if it is sustainable, is a helluva deal. Who knows what might happen in a few years time, but in my case looking at the rate at which I am adding images to my local drives, having an open ended back up for images I want to make sure I don't lose at such a low monthly rate seems like a no-brainer. I've signed up. Here's my PRO stream. Now I just have to start putting better organisation into place for my other non-professional work. I've been giving this some thought too as I am hovering around 900 images. I could perhaps just clear out some older ones to keep under 1000 or move over and make better use of it as an online image backup. As you say, it is quite a reasonable price for cloud storage. I have a free acount and have only uploaded jpg images. Does anyone know if you can upload RAW files and TIFF? I don't think you can, but I will check and report back. the Uploader is allowing recognising TIFF, JPEG, JPEG2000, BMP, GIF but not RAW as far a I can tell (Fuji .RAF or Nikon .NEF). @DallasI'm in the opposite end. I've been a Flickr pro member since 2006. In the process my engagement fluctuated between enthusiasm and indifference. When my other professional side as an architect started growing, particularly after I started my PhD in architecture, my time for online engagement started shrinking. Now, I barely have time to edit. A couple of months before this change in I decided to quit being pro. I was not taking much advantage of the pro features and hadn't uploaded a thing in almost two years to my personal account. When this 1000 limit came I decided to remove all the private stuff (backup mainly), which got me under 1000 limit. Like you, I'm using images hosted on flickr in my website/blog but don't have bandwidth limitations, just storage. I tried to upload an Olympus raw file and it wasn't possible, so I guess it's either TIFF or JPG for storage on Flickr.